ParentPay is a convenient way to pay for services using a secure online service. Making secure payments online using your credit or debit card. ParentPay offers you the freedom to make payments whenever and wherever you like, 24 hours a day, 7 days a week – safe in the knowledge that the technology used is of the highest internet security available. Parents will receive a letter to activate your secure online account using a unique username and password. 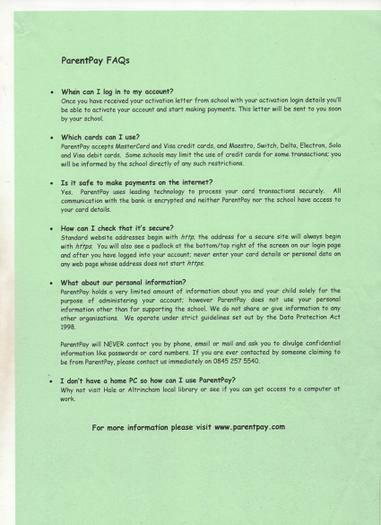 We request that all parents register with ParentPay, as this system will be used to communicate with parents and also will be available in due course for other payments (such as book bags, PE bags, school trips etc). Once registered you will be prompted to change the details and to keep them safe and secure. If you have more than one child at school or children at another ParentPay school, you can create a single account login for all your children.